B Borooah Cancer Institute Recruitment 2019 March | Clinical Assistant Posts :- Welcome to North East India's No. 1 Job Portal NeCareer.com . 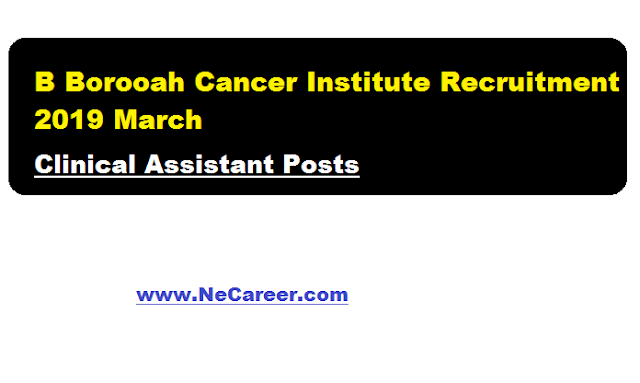 Dr B Borooah Cancer Institute, Guwahati, Assam has issue a job notification in March 2019. According to the recruitment applications in the prescribed form are invited from Indian citizens for the contractual post of Clinical Assistant at Dr B Borooah Cancer Institute, Regional Cancer Centre, Guwahati-781016, Assam, India. Find more details about the job in below section. Educational Qualification : Candidates must be graduate in any discipline from a recognized university with one year Computer Diploma and one year working experience. Age Limit : Below 30 years (Relaxable in exceptional cases). Eligible & interested candidates may submit their application in the prescribed format supported by attested copies of certificates & mark-sheets to the Director, Dr. B. Borooah Cancer Institute, Guwahati-781016 on or before 05.04.2019. The list of eligible candidates for computer typing / efficiency test will be published on 08.04.2019 in the BBCI website http://www.bbcionline.org/advertisement.php. 1) The decision of the Institute as to eligibility or otherwise of a candidate will be final. 2) The applicants, who do not have requisite qualifications up to the last date of submission of applications, will not be considered. 3) Incomplete applications will not be considered. 4)The Institute reserves the right to reject or accept any candidature without assigning any reason thereof. 5) The Management of Dr B Borooah Cancer Institute will not be responsible for rejection of applications due to late postal delivery or lost in transit. 6)Mere fulfilling the minimum educational qualification and experience doesn’t bestow right to a candidate to be called for interview.